The 2014 Formula One season is the 65th season of the Formula One World Championship. The motor racing championship is the highest class of competition for open-wheel racing cars. 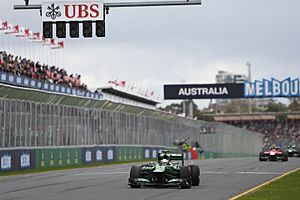 The 2014 season started with the Aussie Grand Prix on 16 March 2014. The last race of the season is the Abu Dhabi Grand Prix on 23 November 2014. Eleven teams and twenty-two drivers are competing in nineteen Grands Prix. Sebastian Vettel started the 2014 season as the defending Drivers' Champion. The Formula 1 World Champion in Abu Dhabi was Lewis Hamilton. He finished 1st in the race. 2014 Formula One season Facts for Kids. Kiddle Encyclopedia.